Also known as “The Feast of St. Patrick”, this celebration is held on the 17th of March every year, which is the traditional date of the death of the patron saint of Ireland. “Everyone’s Irish on March 17th” – St. Patrick’s Day is celebrated in more countries than any other national festival. This holiday was originally just another public holiday in the Republic of Ireland, Northern Ireland, the Canadian province of Newfoundland and Labrador and the British Overseas Territory of Montserrat. It is now a great opportunity for celebration in Great Britain, Canada, the US, Argentina, Australia, New Zealand, Switzerland, Russia and parts of Asia. If you want to be in Ireland while the festivities take place, you should go before the 17th. There, the celebration lasts for 4 days (16th – 19th of March this year), and the best place to be in is Dublin. You should bring some green clothes and accessories. That is valid for any other destination, as St. Patrick’s Day is all about green. Many iconic buildings there are going to be decorated with green lights, so it is a very nice idea to take a stroll and check out the city. 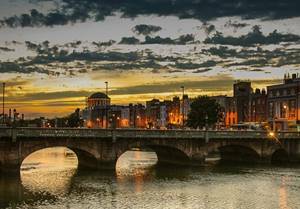 Other very interesting things that you should check out are the Irish Craft Beer Market, the Festival Céilí, the St. Patrick’s Festival Treasure Hunt, the walking tours, the street performers, the Irish University boat races (river Liffey). Go to the Guinness Storehouse (it is going to be crowded on the 17th). You really shouldn’t miss out on the St. Patrick’s Day Parade. Check out the best hotel deals in Canada! Some great things that you can check out in Great Britain around this holiday are: Horse racing at the Cheltenham Festival, which usually takes place on the same day of this celebration. Birmingham is where you will find the largest St. Patrick’s Day Parade (a 3km route). London also hosts a parade in the weekend closest to the 17th, in Trafalgar Square. Liverlpool, Manchester, Coatbridge and Glasgow are also good places to be in during this holiday if you want to make the most of it. The St. Patrick’s Day Parade held in New York City is one of the largest in the world. Fifth Avenue is taken over by marchers and the atmosphere is fantastic. Chicago is a spectacular place to visit during this holiday. 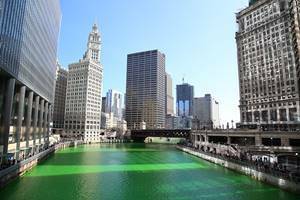 The Chicago river is turned green every year using around 40 tons of dye. Canada does not fall behind on celebrations. Another one of the largest St. Patrick’s Day Parades takes place in Montreal. Manitoba is another great place to visit, since the city runs a yearly 3 day festival of music and culture, all about St. Patrick’s Day. Parades and festivities take place in many other cities, such as Vancouver, Quebec City, Toronto and Calgary. Go to Buenos Aires to celebrate! The downtown street of Reconquista is where you can go to party. 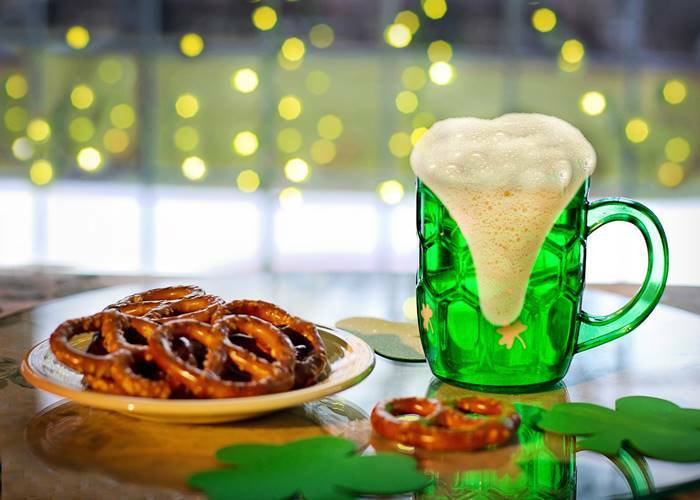 The several Irish pubs that can be found in the area are faithful to the tradition of St. Patrick’s Day celebrations. Russia is one of the countries that is really keen on celebrating the Irish culture. 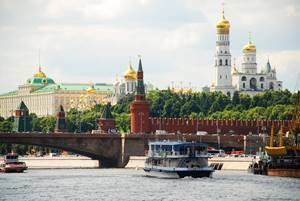 The Irish Embassy, alongside the Moscow City Government and other organizations are usually sponsors to many events taking place in Moscow, St. Petrersburg, Yekaterinburg, Voronezh, and Volgograd. The official Moscow St. Patrick’s Day Parade is military style, while the unofficial parade, organized by volunteers, resembles a carnival. Check out all the hotels available and hotel deals in any of these countries and cities during this wonderful celebration and plan your perfect trip! Look for the available flights to reach your destinations and enjoy the festivities!